When you think about clutter, your mind may quickly gravitate to the piles of stuff you can physically see with your eyes – a stack of magazines from one (or more) subscriptions you keep meaning to cancel or that forsaken drawer in the kitchen, full of things long forgotten. Today, a different kind of clutter plagues Americans, and it might not be nearly as easy to identify: digital clutter. From the bytes that build up on our computers to the apps, pictures, and text messages taking up space on our smartphones, digital clutter can be just as distracting as the things that physically pile up around us. We surveyed over 1,000 Americans about their digital collecting habits and how they felt knowing it was all there. Continue reading to see what we learned. If you think millennials are the guiltiest party when it comes to smartphone storage clutter – think again. Gen Xers had the most saved pictures, unused applications, and even broken (or unused) phones floating around. Millennials were more likely to claim higher capacities of both external storage and cloud-based storage, in addition to the number of physical hard drives. 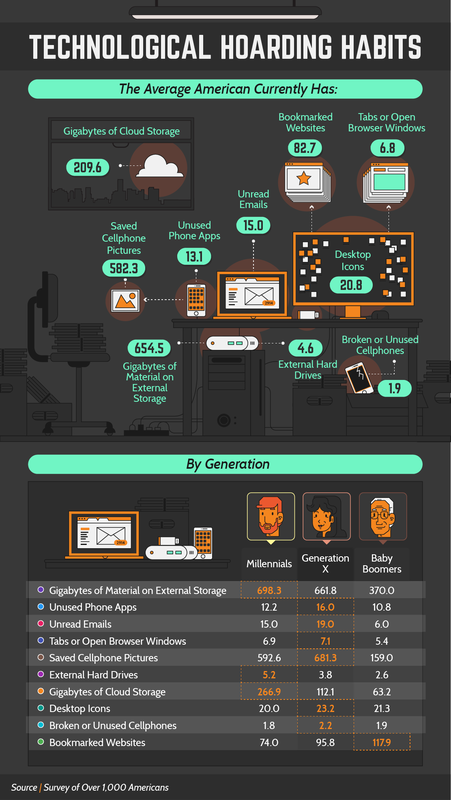 While millennials may have had the most data backed up to other sources, and Gen Xers were the most likely to let their photos, emails, and other data pile up, baby boomers were the champions of one kind of web-based data – bookmarked websites. 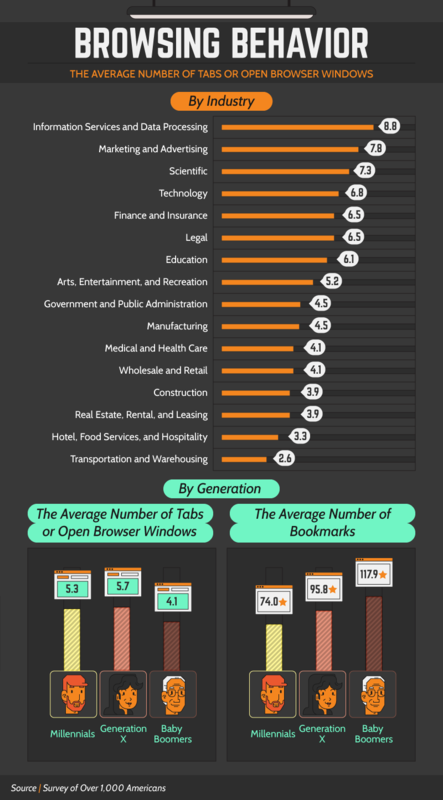 On average, they had nearly 118 bookmarked sites between all of their devices. There are plenty of things in life that can make people unproductive – social media, the newest episode of whatever’s streaming online, or even having too much work on our plates. But what about that digital clutter? From the documents filling up space on our desktops to the emails in our inboxes or the apps we don’t even remember downloading, digital clutter can cloud our workspaces and negatively impact productivity for some, according to our survey results. More than 40 percent of millennials and Gen Xers believed they got less done throughout the day because of their disorderly digital content, and women were significantly more likely than men to find this disorganization distressing. Our survey also revealed certain industries were more likely to find the build up of digital bulk more bothersome. 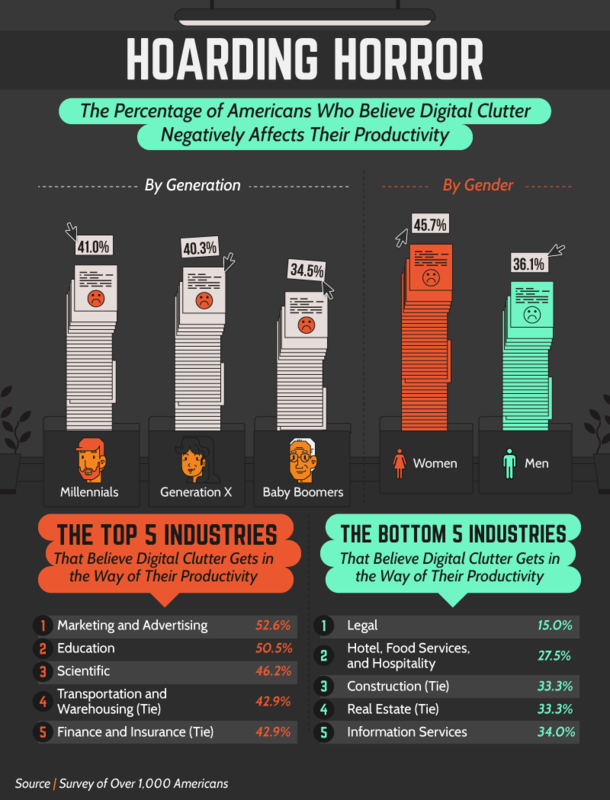 More than half of Americans employed in marketing and advertising or education said the clutter negatively impacted their productivity, while those in the legal industry and hospitality were the least bothered by it. If you think the amount of time you spend sifting through emails at work is obnoxious, just wait until you hear how quickly those seconds, minutes, and hours add up. One study found that the average American spends just over four hours a day on their email alone, which equates to more than 20 hours a week and more than 1,000 hours every year. 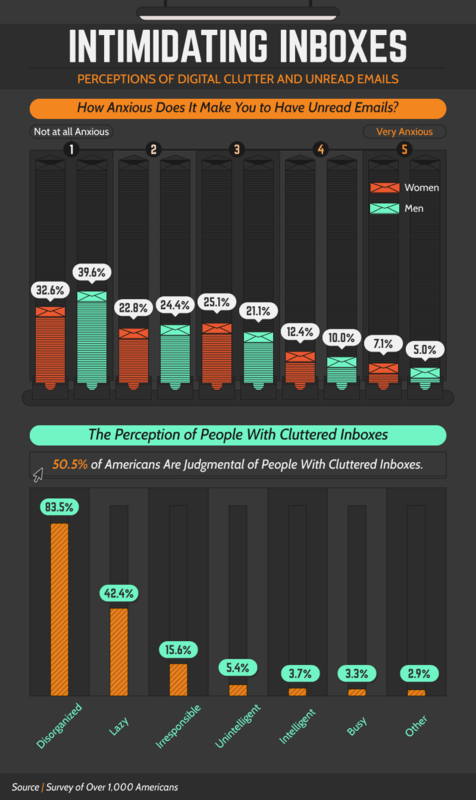 Given all this time spent opening, drafting, deleting, and responding to emails, over half of people had some judgment toward other people with cluttered inboxes. Their top perceptions? Over 83 percent of Americans perceived someone with a full inbox as being disorganized, while more than 42 percent believed it was a sign of laziness. Whether it’s the fear of judgment or the panic of procrastination, more than 60% of respondents said they experience some form of anxiety with unread emails in their inbox. So how many emails are in our inbox? The median response we got from over 1,000 Americans indicated they had 15 unread electronic messages, and 29 percent had none at all. 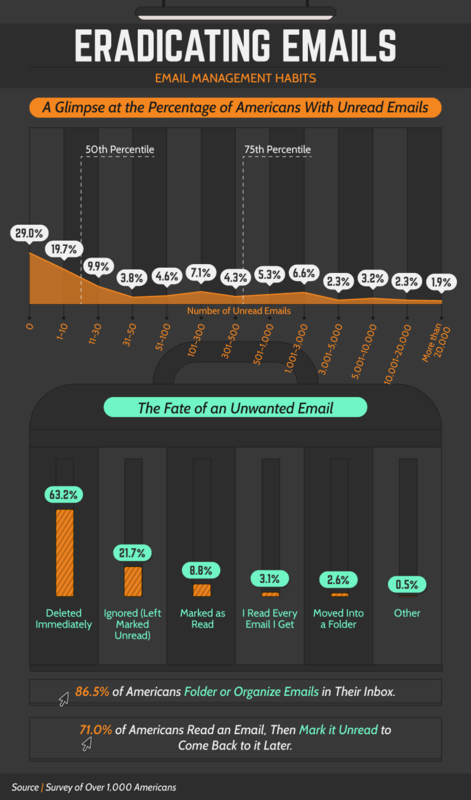 While nearly 1 in 5 had between one and 10 unread messages, roughly 10 percent had between 11 and 30 unread emails lingering in their inboxes. A part of managing seemingly unmanageable clutter may involve how we handle the emails we know we won’t read. Less than two-thirds of Americans deleted those messages immediately, while nearly 22 percent of people left the messages marked as unread. For millions of people buying smartphones, the quality of the camera is one of the most important features on any device. One report found that virtually every smartphone user in the world uses their phone to take pictures, and a vast majority send those pictures elsewhere. Our study found women who owned iPhones had over 2.6 times as many photos saved to their devices than women who owned Android phones, and men with iPhones had more than twice as many images saved as their Android brethren. iPhone users took and saved significantly more pictures than Android owners. Old photos aren’t the only things that can pile up on a smartphone, either. 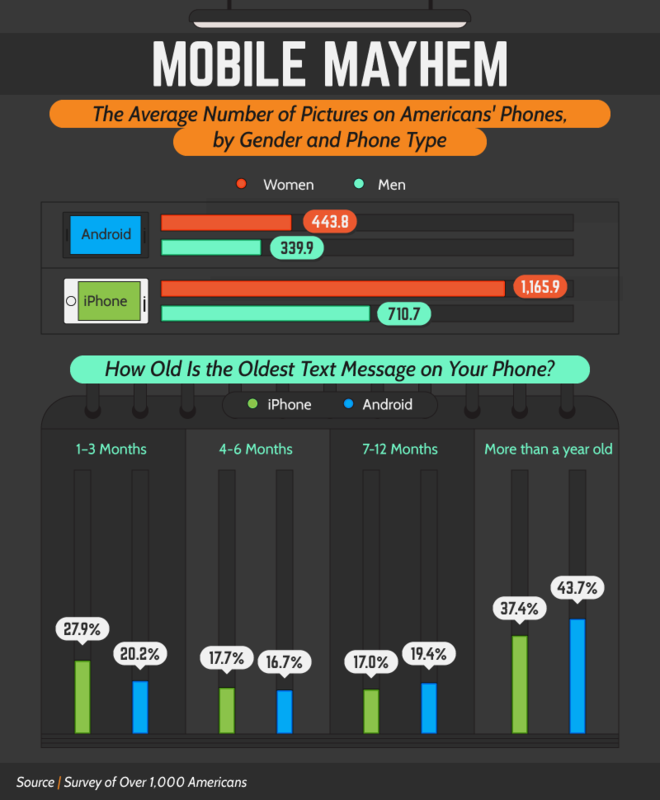 Over 37 percent of iPhone users and nearly 44 percent of Android owners had text messages that were more than a year old. On some smart devices, these relics can hog valuable storage (for things like more pictures). In 2016, people around the world purchased more than 1.5 billion new smartphones. In the U.S., while the purchasing process for phones through major cellular providers may have shifted in recent years, the total number of sales continues to climb. Reports typically vary on how often people choose to upgrade their smartphones, but research shows that iPhone users have a more frequent rotation than Android owners. Among Americans surveyed, millennials and Gen Xers changed their smartphones at the same frequency. 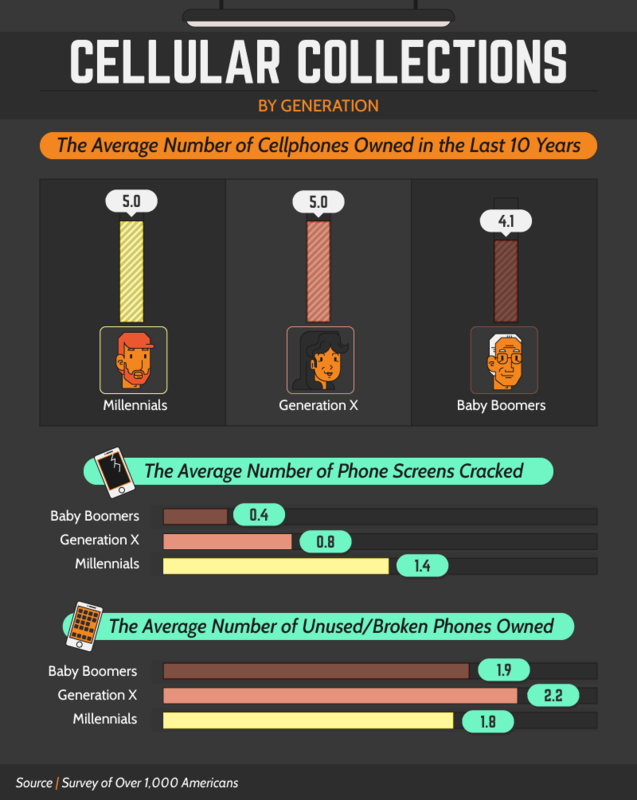 While each generation owned five phones over the last 10 years, baby boomers switched less often. In reality, baby boomers may buy fewer phones because they’re more careful with their devices. Over their lifetimes, millennials cracked the most phone screens (averaging 1.4 each), while baby boomers and Gen Xers did the same to less than one phone each, on average. If your computer isn’t fully running up to speed or you’ve noticed that your web pages just aren’t loading like they used to, the problem may be more obvious (and easy to fix) than you think. The internet can be a rabbit hole. You start out with one thing in mind, and then a litany of other articles and pictures catch your eye – before you know it, you’ve got several tabs open in your browser and your computer is probably worse off for it. Having too many tabs open can crush your computer’s virtual memory (and, by extension, RAM) power. The industry most likely to experience this lag? The IT crowd. People working in the information services and data processing sector had an average of roughly nine tabs regularly open, while marketing and advertising aficionados had eight. Gen Xers also had a bigger tendency than any other generation to keep more web pages open at a time, while baby boomers were more likely to bookmark a page (or 118 of them). Having too many tabs open isn’t just a bummer for your computer speed, either. Some people indicate that having too many web pages open at once can hinder their sense of productivity and even add stress to their lives. Having too many web tabs open isn’t the only thing that might slow down your computer – a cached history can do it too. In addition to potentially hindering your computer’s speed, cached web pages can hog up valuable space on your computer’s hard drive, making it an especially aggravating problem to have. Over 26 percent of Americans only cleared out their browser histories a few times each year, and more than 7 percent never did it at all. Still, some Americans were diligent about keeping their histories clean (if not always for the most honorable reasons), with nearly 1 in 5 clearing their histories every day or every few days. The primary reason for keeping the history bin empty? For a majority of men and women, it was to clear out space. However, for over 36 percent of men and more than 13 percent of women, it was about making sure there were no traces of adult content. 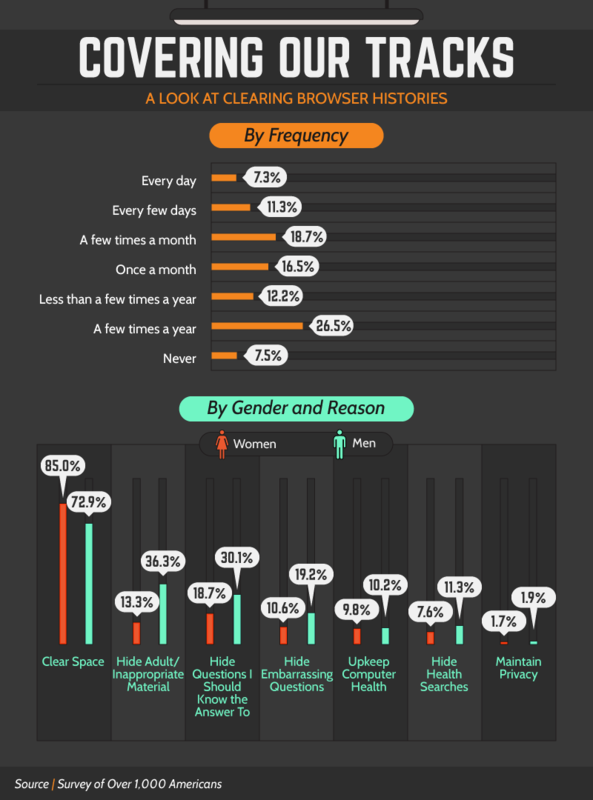 Over 19 percent of men and nearly 11 percent of women also didn’t want anyone to know the embarrassing questions they looked up online. Considering that one of the most frequently asked questions is “Am I pregnant?” your questions might not be that silly after all. Regardless of age, device, or even profession, many Americans have hundreds and even thousands of gigabytes of data floating around their lives. From the information stored on external drives to the hundreds of pictures currently saved on our smart devices, we all have digital clutter. For some people, that sense of disorganization can result in feelings of anxiety and unproductiveness. At Summit Hosting, we make cloud-based storage solutions work for you. Available for both U.S. and international businesses of all sizes, our team will help you find ways to utilize our services to streamline and enhance your workflow. Our focus on dedicated servers, the best in security, and specialized tech support is designed to give you peace of mind for all your hosting needs. Visit us online at SummitHosting.com to learn more. We surveyed over 1,000 Americans about their technology collections, email habits, and digital clutter. All figures, except for quantities of emails, were computed using mean values of self-reported data. Figures regarding emails were computed using median values.